1. Teach the song, and tell the students what the words mean These projectables are from the Concept Slides in the Musicplay Digital Resource PowerPoints. They are also in the Concept Slides section at www.musicplayonline.com . Play the Game!!! The traditional game is a stone passing game. I’ve done it that way with students, but when I turned the game into a stick passing elimination game, it because a requested activity! When doing passing games with grade 2, I start with the pile of sticks in front of me, and pass them out one at a time to my right. I say, “Pick up, set down” and the child on my right does that. Then there are 2 children who pick up, set down, then 3, then 4 until the whole class has a stick. This is the way to get kids to all go in the correct direction when passing! I mark one stick with tape. The pattern we used was: tap, tap, set down (in front of the person on their right), pick up. (pick up the new stick) . We sing the song and at the end of the song, the child with the marked stick is “out” and starts a new circle in the center. I go into the circle with the first out. They change sticks so the marked stick stays in the outer circle. Once you’re in the middle, you’re just playing for fun. There’s a kids demo video of this in the Musicplay Digital Resource, and at www.musicplayonline.com . 2. Show where Ghana is on a world map, and show the students what life is like in rural northern Ghana. My friend, Marilyn Pottage, took these photos on one of her many trips to Ghana. She runs a foundation that helps provide secondary and university education for girls. These photos are in the Concept Slides of the Musicplay 2 Digital resources and are in the Concept Slides of musicplayonline.com. 3. Have the students pat the beats in the song. I like to have them count the beats, then check if they have them right, on a beat chart. 4. Then I have the students clap the rhythm – the way the words go. Then we figure out how many sounds are on each beat. There are a series of beat/rhythm interactive activites at www.musicplayonline.com . The interactive activities follow the same process. The interactive activities at www.musicplayonline.com are awesome BECAUSE they are interactive. When you press PLAY on “Point to the Beat” – the beats pulse as the song is sung. 5. Be sure your students understand the difference between beat and rhythm. You can use “Is the drum playing beat or rhythm” to assess formally if students can tell if it’s beat or rhythm. If you have student iPads or chromebooks, students can use the student login for www.musicplayonline.com . and they can complete the One sound, two sounds or more than one beat activity on their device. 6. Clap a phrase of the song, and have students figure out how many sounds are on each beat. In this song, they’ll be figuring out if there are some sounds that last more than one beat. If you prefer to have hands-on manipulatives for your students, printable manipulatives of the same activities are given in the printables section of www.musicplayonline.com . For some songs, I like to give the students a set of the rhythm cards (#3-4) and ask them to re-create the rhythm of the song. Easy sets include the words of the song, but if I want to challenge the students, I’ll take out the words! We’ve made the rhythm cards so it’s very quick to copy onto cardstock, then cut out. I store them in CD envelopes so I can see through the envelope window and know what song the set is for. The Rhythm Sort worksheet is a written version of an online rhythm sort activity. Write the Rhythm would be a great assessment. Should you do every activity for this song? Of course not. I’ve given the wealth of activities at musicplayonline so you can choose the activity that meets the needs of your students. If your 2nd grade are amazing readers, challenge them with a rhythm sort. If you have a challenging class, or this is the first year you’ve taught these children, they may still need a beat pointing page. How many lessons will this take? That also depends on whether your students are struggling or strong readers. But, I would allow more than one lesson, especially when you want to get kids creating their own music! Create and Perform: Whether your students are amazing readers or still struggling, all students should be encouraged to create their own music. One of the ways that works well, is to have them create with word rhythms. Two ways to create are given at www.musicplayonline.com . The first is creating with words or just use the notes. When class time is really limited, do this as a teacher led activity. If you have more time, students could do either of these activities on devices, or you could print out rhythm cards or word cards for them to use to create an 8 beat rhythm. Teacher can model with the interactive projectable above – then it’s easy for students in pairs or small groups to create their own word rhythm, or note rhythm using the cards pictured below. Assessment: As with all new concepts, you may want to assess if students understand. 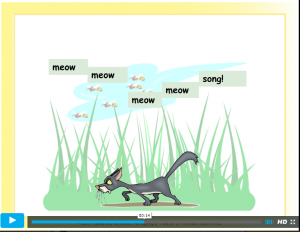 The Rhythm Sort and Rhythm Erase activity at www.musicplayonline.com . are both great. I might do the rhythm erase first. Note that we haven’t included the song title. We did that so you could use it as a mystery song. The Rhythm Sort is a great activity to do as your assessment of the “Obwisana Unit.” There is a printable version of the rhythm sort in printables online. Obwisana Lesson Ideas Screen Cast: I created a screen cast to show teachers in a video the materials in this newsletter. I made a mistake though – and didn’t include in the video the Concept slides about Ghana. So be sure if you teach this lesson, you include the cultural context. You can watch the video at: https://www.youtube.com/watch?v=TLB99FyylsA&t=5s . The video includes the kids demo of the game. 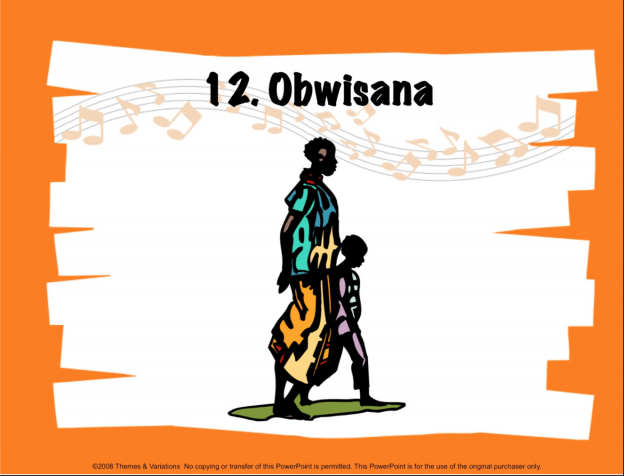 Hope you enjoy the screencast and newsletter with lesson ideas on Obwisana! Musicplay Teachers Group on Facebook! Next Blog Post – Chinese New Years lesson and ideas! This entry was posted in Lesson Plans, Multicultural Songs for Children, Music Theory, Teaching Tips, Uncategorized and tagged Denise Gagne, how to teach ties, Obwisana, Obwisana Denise Gagne, Obwisana lesson ideas, Obwisana lesson plan, teaching tied notes on January 21, 2018 by Denise Gagne. Songs can be taught in one of three ways: rote, reading, or immersion. Choose the best method for teaching your students and teach the song and play the game. ROTE: When teaching by rote, you teach the song phrase by phrase. You sing a phrase – the children echo. You sing the next phrase, the children echo. Then you combine phrases: you sing two phrases – the children echo. Finally, you sing the entire song, the children echo. IMMERSION: When teaching very young children, teaching by immersion is effective. You have the children listen while you sing the song several times. They might listen and pat the beat, listen and move like you do, listen to answer a question you’ve asked. You might choose to teach Sleepy Bunnies by immersion with your youngest students. READING: When children are able to read rhythms and/or solfege, you can begin having them sight-read a song. What a great skill for them to have! Many adults can’t look at a piece of music and sing how it goes, but if taught carefully, our children can do this. 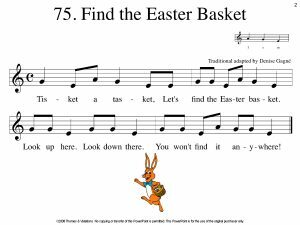 Have the children read the rhythms using whatever rhythm names you use. Sometimes after reading the rhythms I divide the class into two groups and have one group read the rhythms while the other groups reads the words of the song. This helps some children “connect” that rhythm in music is the way the words go. 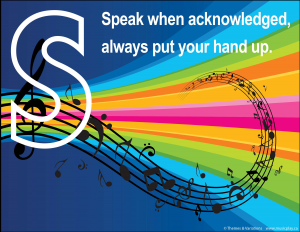 Whether you use reading or rote to teach your students a song depends on If you’ve labelled the rhythms and solfa with your students. If you haven’t taught so-mi-la yet, you’ll introduce the song as a rote song. If you have labelled so-mi-la, then you can have the students sight-sing the song. Teach the song and play the game. Game Directions: One student is the “hider” and one is the “finder.” The “finder” closes eyes while the “hider hides the Easter Basket in plain sight. (not under or in something). The “finder” opens eyes and is guided to the basket by the dynamics in the singing. If children sing quietly he is far away. If the children sing loudly, he’s closer. 2. After playing the song, discuss the dynamics that were used in the song. There is an excellent interactive activity at www.musicplayonline.com attached to song #11. John Jacob Jingleheimer Schmidt in Musicplay Grade 2. Sort the rhythms from quietest to loudest. 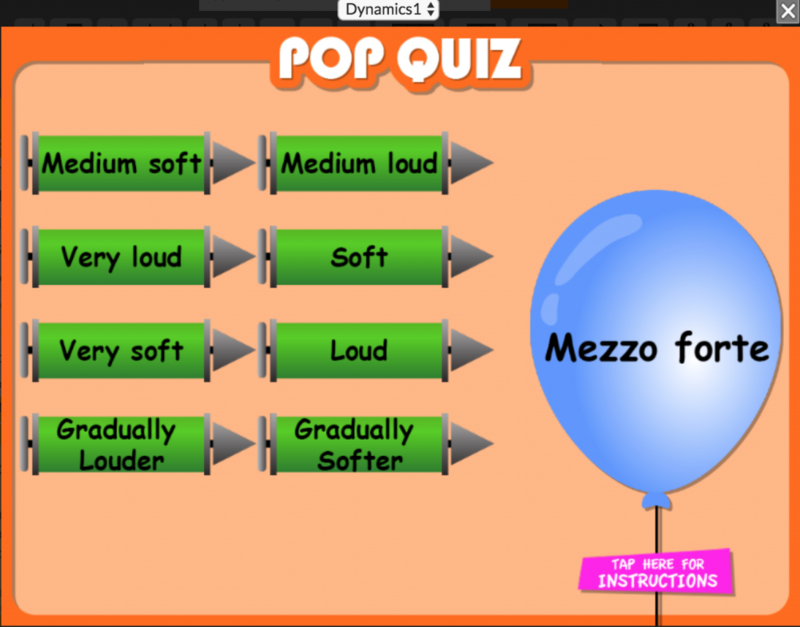 You can also play the Pop Quiz activities on Dynamics at www.musicplayonline.com to teach or practice dynamics terms. There are dynamic symbols printables with song #11. John Jacob Jingleheimer Schmidt in the teacher’s guide and musicplayonline.com that you can print out and package for your students to use. I package these in paper CD holders. It’s quick and easy to make a class set of them, and then I can use them for assessments of dynamic awareness with Gr. 2-6. Give out a set of cards to each child. Have them sort them from quietest to loudest. Check answers. Quiz them on the dynamics shown. Have the students be leaders, and come up with questions for the class. Follow this activity with a listening activity that has students listen and point to the dynamic card they hear in the music. In the Listening Resource Kit 1, #29 Contradance is a great example to use to have children respond to dynamics. 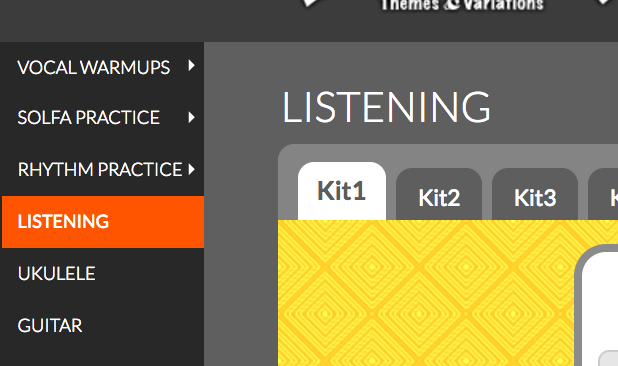 The Listening Resource Kits are now online at www.musicplayonline.com. The Listening Section is found on the left side menu. Select Kit 1, then scroll down to #29. Select the Listening Map. 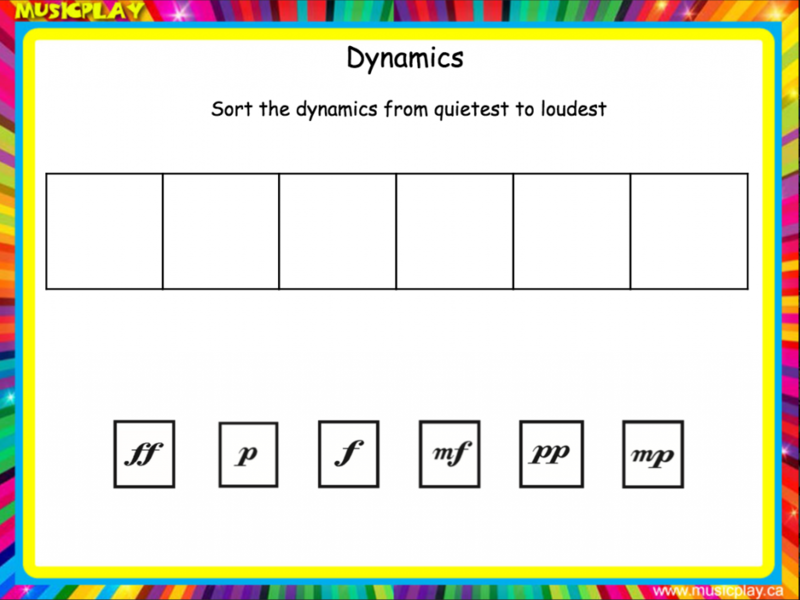 (Many choices are available so you can use the same example in several lessons) Hand out the dynamics cards, and play the recording. The students point to the dynamic Level (card) that they hear. Other good examples to use would include Listen 2 – #26 Summer, Vivaldi or #24 – Hornpipe. Listen 3 – #5 Entry March of the Boyars or $10 Bouree is very good or #17 Intrada, Listen 5 – March of the Dwarfs. 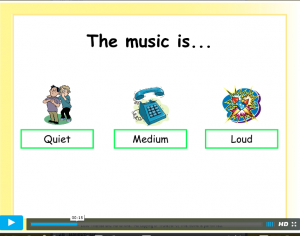 This lesson is from Musicplay 2. Musicplay is a standards based K-6 music curriculum with songs and activities that students LOVE! Musicplay is an award winning music program for K-6 schools. Each grade level includes 40 weekly lessons that clearly outline concepts and skills taught in each grade. Musicplay includes seasonal songs, fun songs, rounds, partner songs, folk music, multicultural music and choral music. In the Musicplay curriculum students sing, play instruments, move to music, listen, create and learn to read and write music. Important concepts are taught through play. Each week in Grades 1-5 a new singing game is taught. 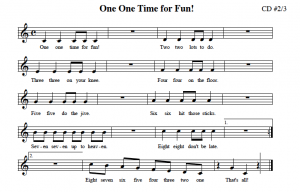 Children love music games making this a text that will have your students really excited about learning music! The program uses Kodàly and Orff sequencing, with lessons that have students creating their own music. Students are taught to read and write music through careful sequencing of activities. Orff arrangements are included for many songs. 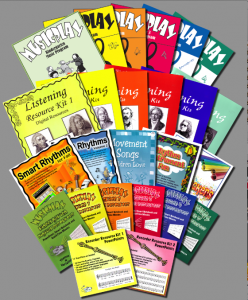 Extensive listening lessons, maps, activities, cup games and intercom scripts are included in the Listening Resource Kits 1-5, and the included listening examples in Musicplay K and 6. 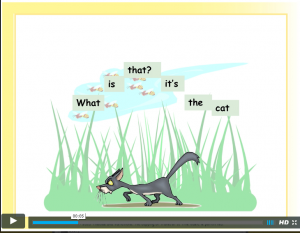 Reproducible song storybooks and Alphabet songs for K-1 teachers integrate with and support early literacy programs. The Digital Resources replace and greatly enhance the material that is in the student books. The music and lyrics are specially formatted to fit a computer/projector screen. 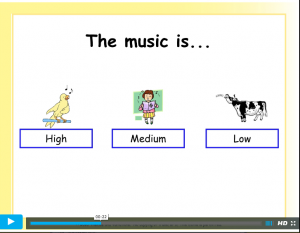 Quicktime movies and PowerPoints of the music and lyrics for each song are included as well as slides to teach note names, solfege, beat, rhythm, dynamics, tempo, form, and cultural context. Smart notebook files are included for teachers with Smartboards. Our new online resource, www.musicplayonline.com includes all the material in the Digital Resources, plus many interactive activities. Purchasers of packages will receive a 1-3 year subscription to the online resource. This entry was posted in Curriculum, Lesson Plans, Listening Lessons, Teaching Tips, Uncategorized on April 2, 2017 by Denise Gagne. Peter and the Wolf is a timeless classic. There are many musical concepts to teach using this wonderful composition. If you’re done teaching for this school year (lucky you!) this is a great time to plan your units for next year. If you’re still in class, these movies could be your lessons for the last month! Visit www.musicplayonline.com to find all these wonderful ideas! 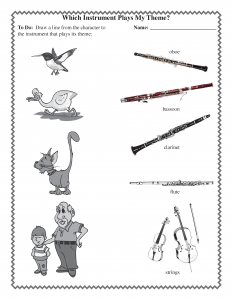 In Peter and the Wolf, Prokofiev uses different instruments to represent the characters. This is a great opportunity to teach children about the instruments of the orchestra. In the Listening Resource Kit 1, Denise wrote words to sing with many of the themes. Stacy Werner illustrated them in the Listening 1 Digital Resource, and Shannon Machtans has turned them into short movies that are now part of the musicplayonline.com resource! 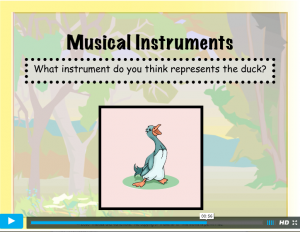 In the movie “The Duck” the little song teaches about the tempo of the music, and the instrument that plays the theme. The duck theme is played by the oboe. It’s a very short listening example. 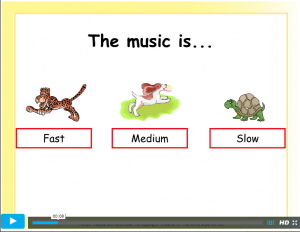 The students are asked to listen and point to slow-medium-fast, pitch: high-medium-low and dynamics: quiet-medium-loud. 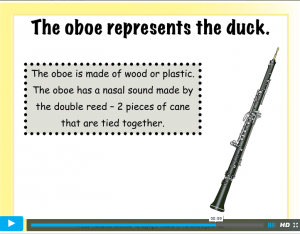 Students are asked what instrument represents the duck, and information about the oboe is given. The Cat song is one of my favorites. The melody is memorable (gets stuck in your head) , and the melodic contour is illustrated as the students sing. 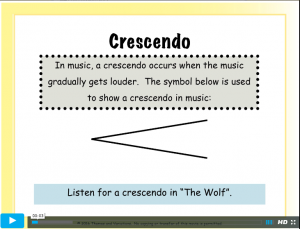 The Wolf is used to teach about crescendo. The entire story of Peter and the Wolf is given on the musicplayonline.com website. After you’ve taught all the themes, the story will be much more meaningful to the students than it would be without the preparation! 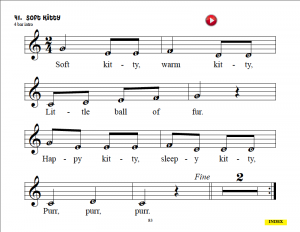 This worksheet comes from the Listening Kit 1 and will be made into an interactive activity on the musicplayonline.com website. Use it to assess how well the students have learned which instrument represents which character. We are still editing the listening movies and creating interactive activities to accompany them, but even as a work in progress, the listening selections on the musicplayonline.com website are a wonderful resource for teachers! Peter and the Wolf listening themes and story! 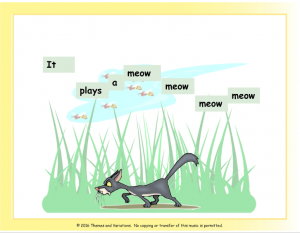 This entry was posted in Lesson Plans, Listening Lessons, Teaching Tips and tagged Denise Gagne, Listening Lessons, Listening lessons Peter and the Wolf, Musicplay, musicplayonline, Peter and the Wolf, Peter and the Wolf listening maps, Peter and the Wolf Listening Unit, Peter and the Wolf themes on May 29, 2016 by Denise Gagne. Boomwhackers? What do you do with them???? I remember the first time I saw Boomwhackers – it was at an MENC conference in Phoenix almost 20 years ago. They looked like fun – and they are! But what do you do with them? Teach Music Reading with Boomwhackers is a new resource, that includes Rhythm Challenges to review rhythms, an introduction to staff and alpha-notes (note names right on the note head, colored Boomwhacker notation, and notation with no hints to have your students reading music quickly and competently! Best of all, projectable PDF files are included. We’ve formatted the projectables to fit the screen – like all of our Digital Resources, the music is large and easy to read. The PDF is interactive:the audio is embedded in the file so you just click on the play button. 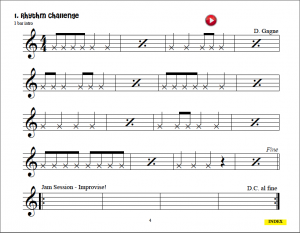 Begin with the Rhythm Challenge to review or reinforce rhythm reading. First rhythms are echoed, then the students read them. Students echo rhythms, then have an improvisation section to create their own rhythms. Fun tracks accompany this! 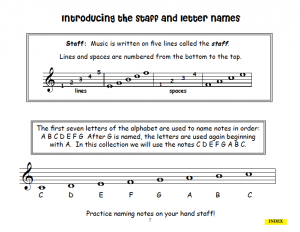 Introduce the staff to the students and how to name notes. The song is given the first time with alpha-notes: the letter name is printed on the note. The second time the song is given with colored notes. All students can be successful! What a great way to introduce note reading before you begin teaching recorders! Try it out! We’ve posted free samples at www.musicplay.ca – click the links below to download samples. 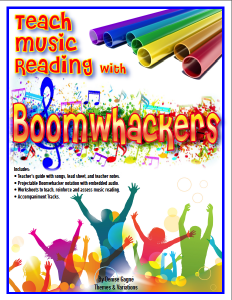 You can download Teach Music Reading with Boomwhackers or order the print copy. With each shipped order, we’re given a set of note squares – this helps cover the shipping cost! You can teach melodies, chords, or rhythms with Boomwhackers. When you use the pentatonic set (CDE GA C’) you can use the Boomwhackers as a rhythm instrument, and improvise and compose rhythms with them. Composing with Boomwhackers includes note squares to help students begin composing rhythms. I’ve used these for many years – they are easy rhythm manipulatives to make (unlike lego rhythms which take hours and hours!) The book includes the note squares to copy and cut out. Make up sets of notes for various grade levels. I use ta, ti-ti and rest for K-2, and add more note values as students improve reading and writing abilities. If I use half note note squares, they are two squares in length. A whole note is 4 squares long. Once students have created the rhythm using squares, they transfer to a beat chart, then to a staff. 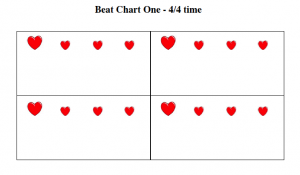 The templates for beat charts in 4/4 and 3/4 are included in the resource. Two, three and four part ensembles are included for students to play, then students write their own. Some melody reading and playing is included in the resource – three note melodies, then pentatonic melodies to play and to create. The final activity in the resource is to have students create their own song. Teach Music Reading is a great unit to use to introduce notation to your students BEFORE beginning recorder. I like to start beginning recorder in January of 4th grade. The students have better fine muscle co-ordination by 4th grade, and they progress as quickly in 2-3 classes as they would have in 5-6 lessons (or more) in 3rd grade. My 5th grade students played recorder in 4th, and in 5th I like to start them on ensembles. I use the Recorder Resource Kit 1 for 4th, and the Recorder Resource Kit 2 for 5th. The Recorder Kit 2 has 24 songs for 2 part soprano with optional alto. Themes & Variations publishes many additional collections for recorders. The Big B-A-G Book has 19 songs using just BAG, including a theme and variations on Hot Cross Buns. It’s great for years when students have trouble reading more notes than just BAG. Musicplay is an award winning music curriculum for elementary schools. 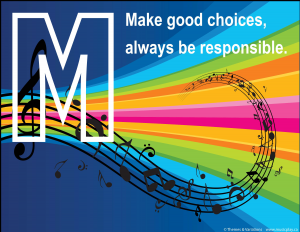 Musicplay is a sequential curriculum with lessons that follow the calendar year. The weekly lesson outlines the new concepts that will be taught, those that will be reviewed, and include seasonal and holiday repertoire. The planning is done for the teacher! This entry was posted in Boomwhackers, Music Theory, Rhythm Instrument Ideas, Teaching Tips and tagged Boomwhacker colored notation, Boomwhackers, Denise Gagne, Songs to play on Boomwhackers, Songs with colored notes for Boomwhackers, Teach music reading with Boomwhackers, What to do with Boomwhackers on January 11, 2016 by Denise Gagne. Some of my American teacher friends are already finished school, but for many teachers you are into the home stretch and looking forward to the end of the school year. Report cards are not anyone’s favorite job, but it’s important to communicate how the students have progressed in music. If we don’t assess, evaluate and report on what we’ve taught, it’s possible that parents will look at music as a “frill” or “something extra” that we do if we have time, and not as a subject area that’s really valuable to our students. is an enthusiastic learner who seems to enjoy music class. 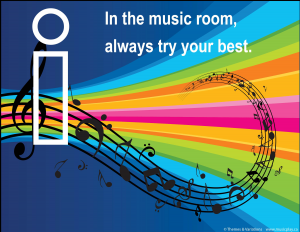 exhibits a positive outlook and attitude in the music classroom. 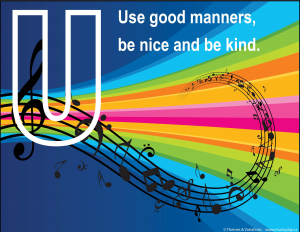 is a positive influence on other students in music class. shows enthusiasm for music classroom activities. strives to always do their best in music class. enjoys problem solving and challenges in music class. takes responsibility for their learning in music class. cooperates with the teacher and other students. transitions easily between musical activities without distraction. is courteous and shows good manners in the classroom. remains focused on the activity. resists the urge to be distracted by other students. 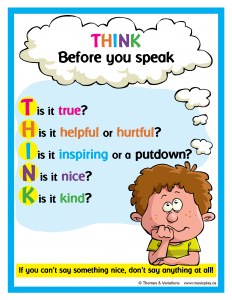 is kind and helpful to everyone in the classroom. sets an example of excellence in behavior and cooperation. shows respect for teachers and peers. treats the instruments with care and respect. The following comments are leveled. Beginning to participate appropriately and actively in music class. Requires frequent teacher reminders. Sometimes participates appropriately and actively in music class. Requires teacher reminders. – Participates appropriately and actively in music class. Occasionally requires teacher prompts. Participates appropriately and actively in all music classes. Can perform some instrument and singing parts with teacher support. 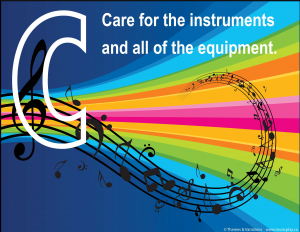 Can perform instrument and singing parts. Requires prompts from the teacher. Can perform all instrument and singing parts independently. With teacher support, beginning to read, write, and identify some grade level beat and rhythm concepts. 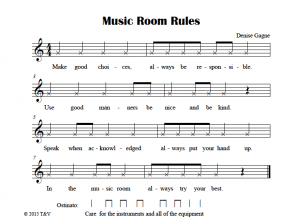 With teacher support, reads, writes, and identifies some grade level beat and rhythm concepts. With teacher prompts, reads, writes, and identifies all grade level beat and rhythm concepts. Independently reads, writes, and identifies all grade level beat and rhythm concepts. This entry was posted in Assessment, Teaching Tips and tagged Denise Gagne, K-5 music report card comments, music assessment, music class report cards, music report card comments, music report cards, report card comments on May 30, 2015 by Denise Gagne. Developing the Child’s Singing Voice I recently read this question on a music teachers facebook page: I’m teaching grade 1 and 2 music. I had 2 of my classes for the first time today and did some call and response tone-matching activities. I was shocked to find that 75% of the students could not sing in their head voice. At least 40% of those students couldn’t reproduce so-mi in a singing voice at all! Any ideas on where I start to help these students develop singing/head voices? In this newsletter, I’ve got some suggestions for warmups, vocalizes and activities to get your kids matching pitch. Start with the speaking voice and work on high and low sounds. 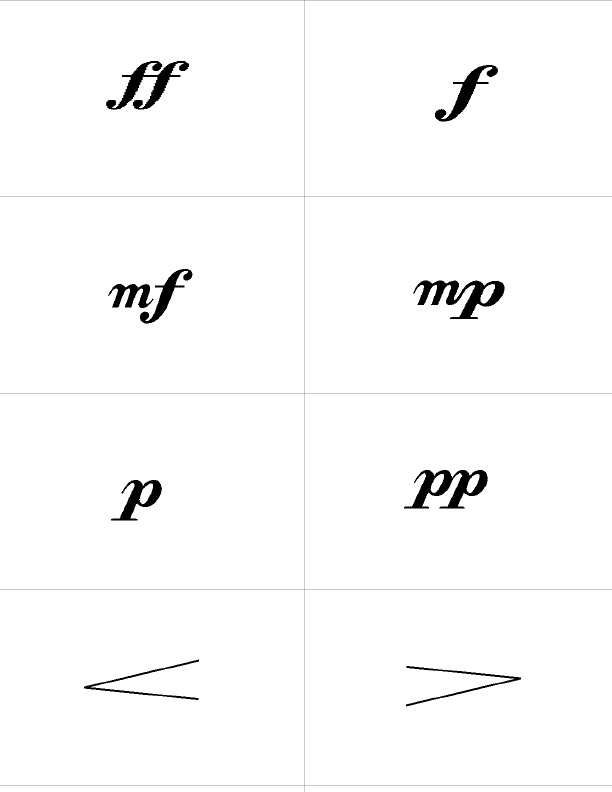 Alphabet Echo: Say the letters of the alphabet in lots of different voices – high, low, silly, scary, monster, and have the kids echo each letter or group of letters. (A or A B C) It’s a fun warmup and for your preK and kindergarten students will reinforce letter recognition. Vocalise: Do lots of vocalises with them. I bought a toy fire engine and play the siren for the kids and have them make siren sounds. I’ve found one Fire Engine storybook, and would welcome suggestions of fire engine stories that you’ve found! I love the slide whistle! Have them echo the sounds that you make on a slide whistle. Do this with your entire group, and then try it with individual students. In John Feirabend’s research, he’s found that children need opportunities to sing alone as well as with the group. low voice – Pussycat, pussycat where have you been? low voice – Pussycat, pussycat what did you there? High voice – I frightened a little mouse under a chair. High Voice – These are Grandma’s glasses. This is Grandma’s hat. This is the way she folds her hands and puts them in her lap. Low Voice – These are Grandpa’s glasses. This is Grandpa’s hat. This is the way he folds his hands, and then he takes a nap. The Three Bears in Musicplay 1, The Billy Goats Gruff in Musicplay for Kindergarten, and The Three Little Pigs in Musicplay 3 are all good for this activity. The low monkey said “You can’t catch me.” Snap! The middle monkey said “You can’t catch me.” Snap! The high monkey said “You can’t catch me.” Snap! I have great puppets to use with this poem, and you can find them at www.musicplay.ca – search for puppets. Boom Chicka Boom in Musicplay 5 is a good chant to use with your older students. After the chant activities do lots of echo singing. Echo so-mi, la-so-mi, so-mi-do, so-fa-mi-re-do patterns. Do 3-4 minutes of these warmups every time you see them and you’ll start to build some flexibility in their voices. Give them 5 or 6 classes of this and you’ll see a big improvement! 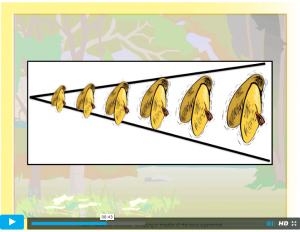 This entry was posted in Teaching Tips, Uncategorized and tagged Child's singing voice, Denise Gagne, kids singing, singing in tune on September 28, 2013 by Denise Gagne.